Mobile gaming is a "boon" for the videogame industry, says Alice creator, American McGee. McGee, head of developer Spicy Horse, says that after Alice: Madness Returns comes out, it may be some time before the studio makes another game like it. Instead, the studio's focus will be on exploring the new frontiers opened up by mobile and online gaming. "I think it's really awesome," he said. "It's actually where we're pushing our studio to go next. PC online, you know, multiplayer games and also mobile as a function of that." McGee said that the handheld gaming market - and particularly the Android gaming market - was going to encourage a lot of creative and interesting ideas, especially in terms connecting social networks and games. He didn't rule out going back to making more traditional games, but said that for the next couple of years, at least, the focus would be on free-to-play online PC games, and mobile games. McGee's output has always been a little on the dark side - aside from the Alice games, he's also worked on the Doom and Quake games, and game based on a twisted retelling of the Grimm Fairy Tales - so it will be interesting to see what he does with mobile and F2P gaming. Hit or miss, it's almost certainly going to be something very interesting. 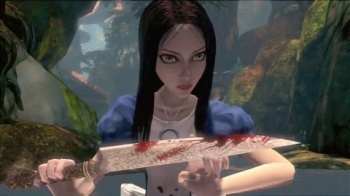 Alice: Madness Returns comes out for PS3, PC, and Xbox 360 in June.